SHSU faculty and staff members will celebrate Independence Day with a day off, as the university will close in recognition of the July 4 (Friday) holiday. Students will have a week-long break between summer session classes this year, with residence halls closing on Tuesday (July 1), at 10 p.m., and reopening at 11 a.m. on July 7. Classes begin for the second summer session on July 8 and will be held through Aug. 7. Summer commencement ceremonies will be held on Aug. 9. The physics department will continue to bring some “color” into its planetarium series program with “The Colors of Summer” and feature presentation “The Cowboy Astronomer” on Tuesday (July 1). Other show dates include July 11, July 15, July 25, July 29, Aug. 8, Aug. 15, and Aug. 29. The Student Advising and Mentoring Center will teach students how to “study smart” with its second summer edition of its Study Skills Workshop series beginning July 7. Sessions will be held at a variety of times on Mondays, Tuesdays and Wednesdays to accommodate student schedules. Beginning July 8, philosophy professor Glenn Sanford will also help law school bound students prepare for the LSAT, the standardized entrance exam. The four-week, SAM Center program will be held on Tuesdays from 5:30 p.m. to 8:30 p.m. through July 29. Class size is limited and students must register to attend. For more information on the study skills series, call 936.294.4444, e-mail samcenter@shsu.edu or visit the SAM Center, located in Academic Building IV Room 210. For more information on the LSAT prep course, or to register, contact SAM Center staff associate Margaret Ferguson at mxf001@shsu.edu or call 936.294.4628. Psychology professor Rowland Miller has been named the recipient of the 2008 International Association for Relationship Research Teaching Award. The award, presented biennially, is based on an individual's contributions to the scholarly study of relationships, teaching students about relationships and mentoring new generations of relationship researchers. Miller will travel to Providence, RI, to officially receive the award July 17-20 during the 2008 IARR Conference. A faculty member at SHSU for 30 years this fall, Miller is currently working on revisions for the fifth edition of his popular psychology textbook “Intimate Relationships,” which is anticipated to be released for the Spring 2009 semester, according to the Item story. The International Association for Relationship Research is an organization of relationship scientists that “seeks to stimulate and support the scientific study of personal relationships and encourage cooperation among social scientists worldwide,” according to the IARR Web site. 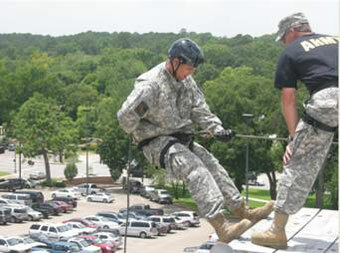 Retired Lt. Col. Alan Mooneyham, former head of SHSU’s Military Science Department, instructs Sam Rayburn High School sophomore cadet Joshua Garza on how to rappel off the roof of the Farrington Building during training on the SHSU campus. Eighteen Junior ROTC cadets from Sam Rayburn High School in Pasadena conducted their JROTC Leadership Camp at Sam Houston State University June 23-26. Hosted in large part by Lt. Col. Rick King, head of the SHSU Military Science Department and the Bearkat Battalion, this was the second consecutive year SRHS students came to campus for the training. The leadership camp included several days at Gibbs Ranch, during which the JROTC members bivouacked and used the ROTC facilities to participate in the obstacle and leaders’ reaction course, as well as conducted land navigation and practiced basic leadership, according to retired Lt. Col. Alan Mooneyham, SRHS JROTC instructor and former head of SHSU’s Military Science Department. The 18 JROTC cadets were selected from the Rayburn JROTC program of over 250 high school other cadets, according to Mooneyham. Mooneyham and King said this event is a win-win opportunity for both SHSU and Sam Rayburn. “The leadership camp teaches basic leadership and self-discipline, while conducting it on a great university campus like Sam exposes high school students to an achievable alternative after high school,” Mooneyham said. In addition, King awarded each of the cadets with their camp completion certificates, recognized six for earning the RECONDO badge, and extended an invitation to SRHS again next summer. SHSU foreign languages professor Enrique Mallén gave his perspectives of Pablo Picasso to art students and professors at the Universidad Iberoamericana—Puebla on June 25. Mallén’s lecture, “Una nueva perspectiva sobra la obra de Pablo Ruiz Picasso” (A new perspective on the work of Pablo Ruiz Picasso), was delivered in Spanish in the campuses’ main auditorium and was followed by a 45-minute question-and-answer session. It was very well received by the audience,” Mallén said. Mallén was invited to discuss his Picasso Project, an online catalog of the famous Spanish artist’s works, by José Valderrama Izquierdo, director of the department of art, design and architecture at the Universidad Iberoamericana-Puebla, who is a “regular user” of the Web site, Mallén said.